they were plain brown "leather" and did I mention super comfy? I decided to throw them in the wash. I was almost in tears when I took them out! 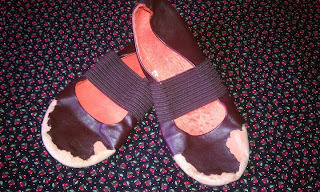 The "leather" had peeled and my flats were ruined! Around that time I was obsessed about making my own pair of flats from scratch. So for the last 6 months they have been sitting on my refrigerator.. I know, I know lol... waiting to be taken apart and a pattern made from the pieces. And boy am I glad that I didn't get around to it!!! 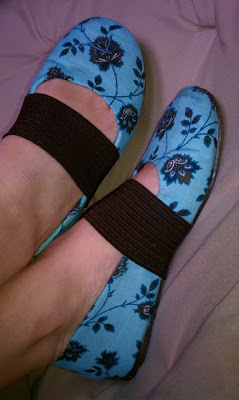 Because now I can just cover them with whatever fabric I choose! I gathered the needed supplies and followed Make it & Love it super easy steps. I used Fabri-Tac Permanent Adhesive.